I don't know how much more can be said about this relatively recent addition to the Chicago pizza scene. After years of complaining about the pizza available in Chicago, finally discovering Chicago-style thin crust stalwarts like Marie's and Vito & Nick's, I leave at the dawn of a Chicago pizza renaissance. 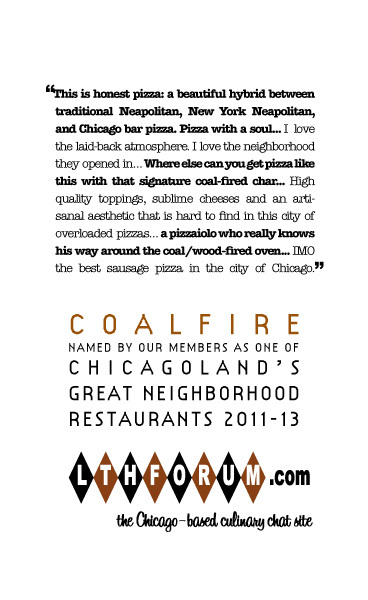 Coalfire immediately vaulted into my top 2 Chicago pizza joints. I love the laid-back atmosphere. I like the BYOB, meaning two can eat for under $25 with a bottle of wine. Or six can down a fifth of bourbon and about 8 pizzas. I love the neighborhood they opened in, where I can enjoy a healthy walk from our River North office, revealing much of Chicago's diversity over a mile or two, and the usual subsequent walk up to the Matchbox. And the crush with which LTHers descended upon the place in its early days has been well-documented in other media as well. There have been a few service complaints, but it seems that was mostly a by-product of said crush. New or no, Coalfire seems like a no-brainer to me. I've been to Chicago just twice since Coalfire opened, and I've been to Coalfire both times. I look forward to my next trip. Last edited by Aaron Deacon on September 12th, 2007, 2:39 pm, edited 1 time in total. I love Coalfire, have been several times, and considered nominating it. But after LTH descended upon them in a crush on day 3, and then some (a limited few) complained online about the restaurant not being able to handle the the crush caused by LTH, I thought they might be inclined to take the GNR and tell us to put it where the sun don't shine. That's not saying I don't think they deserve one; any reservations I'd have would be that it might be a little premature (they've not been open long) and it might be good to let any bad feelings dissipate. I've only been there once, but I felt like there was one really good pizza (the one with Bari sausage) and a couple of others that I didn't like nearly so well, though even so they were obviously better than at least 70% of the generi-pizza sold by the slice around town. I need to go again, although it's hard for me to do so because I end up passing half the woodfired pizzas in town on my way. Anyway, I lean a little toward the premature side, also. Or maybe it's not premature any more, but I haven't been, so I don't know. Has the menu evolved? Has its pizza hand developed? Has its promise been fully realized? I heartily second Coalfire for a GNR. I've been 5-6 times, each time thoroughly enjoying what, in my opinion, is one of the top pizzas available in Chicagoland. I don't know which Gary is eating, but as I mentioned to Mike at the picnic, my perfect pizza is the 'white', PLUS the toppings from the 'sausage.' New Haven purists will have my head, and I get raised eyebrows at the counter for this, but the garlic-and-basil-prepared dough with the more interesting cheese, under red sauce and Bari sausage, is pure heaven. When your WWI-era biplane crashes, you see a perfect little burnt-out cinder impression on the ground. That's exactly what happens to the salami on the CoalFire Fiorentino; it's ex-salami, a burnt offering, a remembrance of lunchmeats past. Mike G wrote: Which one? You mean like do I order the exact same pizza every time? I've never been with less than 3 other people, couple of times 6 or 8, and we tend to order rounds of pizza. If I had to single out one Coalfire pizza I've had, and it would be a close call, I'd go with a nicely blistered anchovy and sausage Steve Z ordered one evening. I'm also quite partial to the White Pizza. I completely agree with this nomination. Coalfire has managed to bridge the gap between the foldable New York style and more traditional Chicago thin crust pizza and have completely won me over, despite being a die hard Chicago pizza snob. Great crust, great ingredients and a pizziolo who really knows his way around the coal/wood fired oven. Early service issues seem to have vanished for the most part. I say Coalfire = yes to a GNR. I'll freely admit that I'm not a deep-dish guy at all - I'm not originally from here and I just don't "get it" - so let that be known as background when I say that Coalfire is my favorite pizza in town. My most recent visit included (among other pizzas ordered) the waitress' recommendation of sausage, hot sopressata and fresh mozzarella - wow! I've simply never had a dud - the pizzas always strike my perfect balance of quality toppings, appropriate levels of cheese and tangy sauce, and of course the thin chewy crust with just the right amount of char. What I said two posts up back in 2007 still rings true for me today. A big YES for renewal. I've been to Coalfire a dozen or more times since they were awarded a GNR in '07 and have come to appreciate the care and thought they put into the pizza, not to mention the deliciousness factor, to an even greater degree. Support for GNR renewal from this pizza lover. I also suppurt this GNR renewal, it's in my neighborhood and I'm happy about it. I will have to admit, I do go less frequently now that it is not BYOB. Two pizzas and a bottle of wine isn't as cheap as it used to be. And with the price being what it is, I tend to go to places I can have a few choices on the menu for the same price. But, I do love the coalfire style of pizza and it's my go to place. The only coal-fired pizza oven in Chicago is merely one aspect of the great pizza turned out here. High quality toppings, sublime cheeses and an artisanal aesthetic that is hard to find in this city of overloaded pizzas, are the rest of the equation. I only wish it were open for lunch because I'd be able to eat there much more frequently if it were. Still, I love Coalfire and I feel that we're lucky to have it, especially in this town where good pizza is ubiquitous but great pizza is still a somewhat rare commodity. Coalfire produces a distinctive, excellent product. I say yes on renewal. Technically untrue; D'Amato's, the other coal oven baker in town, does make Sicilian-style sheet pizza. Mea culpa. I always think of D'Amato's strictly as a bread bakery, even though I know that's not the case. A great big "yes" for renewal. I'm lucky in that Coalfire is my neighborhood pizza place; I usually get it to-go and have had it probably two dozen times since it was awarded the GNR. It's still great and unique pizza - where else can you get pizza like this with that signature coal-fired char? This is my favorite pizza in the city. I would like to express my strong support for Coalfire's GNR renewal (I tried to post in the GNR thread but the system wouldn't let me). Coalfire puts out consistently excellent pies with top notch ingredients. It's one of my favorite spots to take out-of-towners and I've never seen anyone fail to be impressed by the pizzas. A vegetarian friend makes an exception for their sausage pizzas. Also, the staff is incredibly hospitable, they always seem to recognize me (or act like they do) even if I haven't been in for a while--I think this speaks to the spirit of GNR's--a place where you always feel at home. Also, the recent addition of cheesecake to the menu is a definite improvement over the previous dessert option (cupcake top cookies). Nice beer selection, too. I enthusiastically support Coalfire for renewal. Probably my favorite pizza in the city of any genre and a go-to spot before Bulls games. The people there couldn't be nicer, and there always seems to be families from the neighborhood enjoying Coalfire's outstanding pizzas. Many, many, many thumbs up. My wife and I just had Coalfire the other night, after a long hiatus, and we loved it. We also loved being able to walk in and get a table at 8pm on a Saturday night. Good, reasonably-priced wine list too. I vote yes on renewal. Coalfire easily walks the line between trendy, artisanal Neapolitan-style pizza and classic American comfort food. As an added bonus, every single staff member is totally friendly, helpful, and customer-focused - I love how, when I run in there to pickup a takeout order, I'm greeted warmly by every server I pass, and am so genuinely welcomed & thanked for ordering from them. I most definitely endorse a GNR renewal for Coalfire. Coalfire is utterly fantastic. I love their distinctive pizzas, which scratch the itch like almost no other place. Not only is the care consistently evident at Coalfire but the distinctive and diverse flavors of all their pizzas carry through from the first bite all the way through the chew. Service is always friendly and exceptional helpful. I enthusiastically support renewal. My favorite thin crust in the city. Ordered well done w/a side of olive oil to dip the pizza bones in transforms it into some of the best bread service I've ever had. 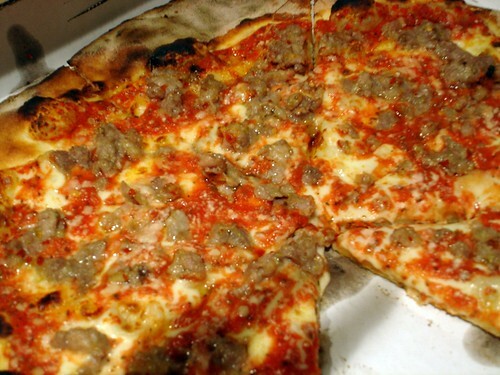 One of our favorite pizza places, alongside Great Lake, Spaccanapoli and Vito and Nick's. Had a wonderful Fiorentino today. Strongly support the GNR renewal. Perhaps my favorite in the city, though Great Lake is walking distance and Coalfire is a nuisance to get to. Love it and enthusiastically support renewal. One telling point for me is that I haven't been to Coalfire in months, but I can't stop thinking about the last Fiorentino pizza I had at Coalfire. I've had other pizzas since then, but that lingers in my memory. Yes to renewal. Yes Yes Yes on renewal.